The Porsche 911 RSR isn’t just a race car. It’s the GT racer Porsche takes to the world’s most important sports car race: the 24 Hours of Le Mans. It’s Porsche’s brand in a nutshell, now with a mid-mounted engine that’s a break from the flagship sports car’s trademark rear engine placement. The 911 RSR is the car used by Porsche’s factory endurance racing teams in the World Endurance Championship and WeatherTech SportsCar championship alike, plus numerous WEC customer teams. For 2017, the 911 RSR has been completely reworked, featuring most notably an engine that is entirely ahead of the rear axle. While retaining the typical 911 design, this is the biggest evolution by now in the history of our top GT model. The new 911 RSR is a completely new development: the suspension, body structure, aerodynamic concept, engine and transmission have all been designed from scratch. That’s just about everything! These changes were necessary, though, for Porsche to remain competitive. When the 2016 World Endurance Championship’s GTE-class regulations allowed for bigger rear diffusers and splitters, Porsche’s factory WEC team sat the year out while a new car could be developed. The existing 911 RSR was already a few years old, and had an engine sitting in the way of those extra allowed aerodynamic bits. The other teams took advantage of the new regulations, and it looked like Porsche would have lost miserably had they stuck around with the old 911 RSR. But they are Porsche. They can’t lose—on principle. Instead, they move the engine forward to accommodate those improved rear aerodynamics and also improve the weight balance of the car. Contrary to earlier reports, Walliser told Sportscar365 that no technical waiver was needed, as the 2017 GTE-class regulations allow them to optimize the engine’s placement. As we’ve noted in spy shots and sketches alike, the Porsche now has a giant diffuser sticking under its rear end to maximize aerodynamic downforce. The car also features a new, more radical looking swan-neck top-mounted rear wing on top of the rear deck, taken from Porsche’s top-class 919 Le Mans prototype. Rumors that the engine had been turbocharged like the highly successful Ferrari 488 GTE and Ford GT race cars did not pan out. However, the all-new, naturally aspirated 4.0-liter six-cylinder boxer engine produces 510 horsepower in race trim in a car that only weighs 2,740 lbs. Like the newest GT3 Cup and GT3 R cars, the 911 RSR’s engine is now based on the current-generation 991 engine instead of the old Mezger block-engine they previously carried over from the 997. Direct fuel injection, a rigid valve drive and extensive use of lightweight materials help the engine be efficient as well as powerful, which is crucial when every refueling stop translates into time lost on track in a race. The engine is mated to a six-speed sequential gearbox, which sits in a lightweight magnesium housing and is controlled by two paddles mounted behind the steering wheel. This transmission puts power down to the massive rear wheels which are 31 centimeters (about 12.2 inches) wide. 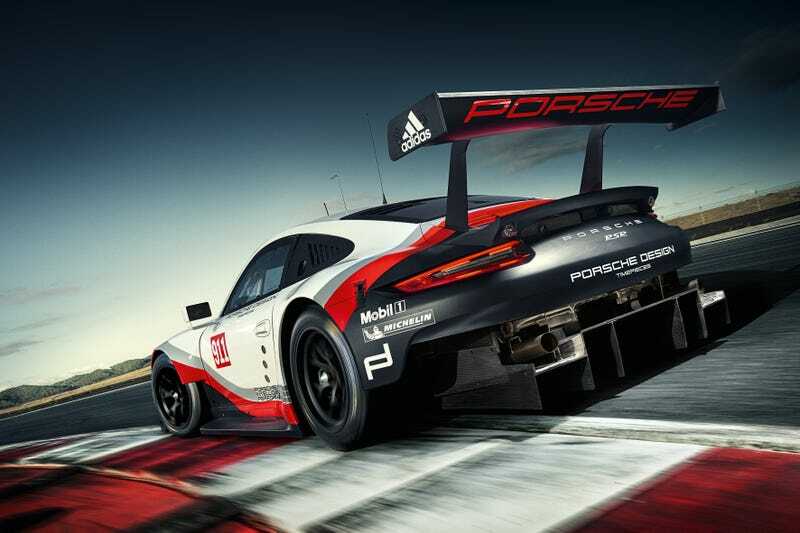 Because it is an endurance racer, Porsche equipped it with a radar-supported “Collision Avoid System,” which warns drivers of approaching traffic, including that of drastically faster racing prototypes coming down the track. There are also driver changes to contend with as well, so the pedals now move forwards and backwards to accommodate different sized drivers in the car’s fixed-mount racing seat. New quick-release fasteners and improvements to the suspension allow entire elements of the car to be swapped in one swift go if a driver gets something wrong out on track. I welcome our new mid-engine overlords, so long as they win. Porsche’s previous flirtation with a mid-engine “911" came in the form of the funky stretched 911 GT1, which got Porsche their 16th overall Le Mans win. The new RSR, however, truly looks like a 911—making it an easier tie-in with Porsche’s road cars. Just in case you still couldn’t tell it was a Porsche, the car’s new livery is a red outline of the Porsche crest when seen from above. The car is set to compete in 19 races in 2017, including the full WeatherTech Sports Car Championship and World Endurance Championship schedules. It will make its competition debut at the 24 Hours of Daytona in January. It's In The Middle? They're Really Doing This? Cool.